Today's Young Adults Service carried great significance to everyone who came. The topic of death and dying is one that all of us will face, yet it is also a taboo as most people shun old age and decay. Most of the world live either in denial of death or in terror of it. Others look on death with a naive, thoughtless cheerfulness, thinking that for some unknown reason death will work out all right for them, and that it is nothing to worry about. Could it be more ironic that young people are so highly educated in every subject except the one that holds the key to the entire meaning of life, and perhaps to our very survival? With the guidance of our Venerables, we delved into the topic of dying and death and gained awareness on its processes, namely both outer and inner dissolution of senses and its elements, the mind at death and how we transition between the different bardos. Hearing the testimonies of Si Xuan and Venerable Ben Si makes the concepts we learnt even more compelling. Si Xuan’s sharing illustrated that there is definitely life after death with her vivid near-death experience. 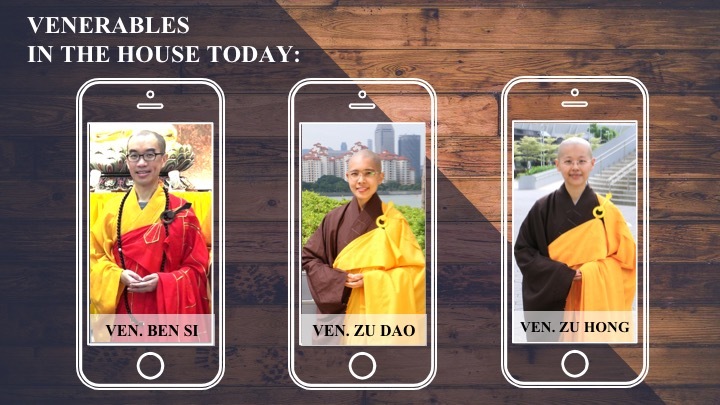 Venerable Ben Si’s sharing showed us the importance of seeking refuge in the Three Jewels as he transcended sickness and death with one-pointed faith. What hit me the most was how our dying thoughts have game-changing effects on our next rebirth. I realised that the overwhelming power of thought is the key issue in the bardo of becoming. This implies that life is infinite and everything we think, say and do, virtuous or non-virtuous in our every living moment counts. Practicing virtuous thoughts in all circumstances, towards all people and situations and learning how to transform non-virtuous ones to virtuous one with the learning of Buddha’s teachings seem to take on a whole new level of meaning for everyone. If we aren’t able to take control of our mind and actions and check our non-virtuous habits and tendencies, we will become their helpless victim in the bardo of becoming. And the effect of that, is devastating. Thinking about death and dying does not make one pessimistic. It is precisely through being aware on the process of dying, death and what’s next, that we can channel our anxiety and fear of the unknown into optimism and hope. We can make positive changes in our behaviour and thoughts to best live every living and dying moment and to best leave for a more promising next life when death comes. It was surely a life-changing afternoon for most of us and.... one of optimism too!